2009 US Open Champion Lucas Glover has these Nike CCi irons in his bag. They're the most inexpensive irons I've seen that an actual PGA pro plays. CCi stands for Composite Cavity Insert. The cavity back design makes the club a bit more forgiving than the typical blades the pros normally use. The insert enhances the feel, which to most pros' dismay, is lost with a standard cavity back. 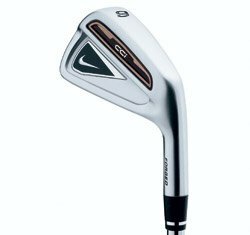 In addition, these irons are constructed from 431 stainless steel which is 25% softer than the 17-4 that is more commonly used, and the tungsten weighted sole moves the center of gravity lower, giving these Nike tour quality wedges even more forgiveness. Finally, the face is milled to give a more consistent distance and minimize shot dispersion. I would recommend these clubs for any low handicapper. You really are getting the best of both worlds, with a forgiving cavity back type club built into a traditional clean-looking clubface. And workability is not a problem either, as they've thrown away the book that says you have to use a blade to work the ball. This is simply not the case -- workability is all about the distance between the heel and toe, NOT what's behind the clubface. Before buying these, you might take a look at the Mizuno MP-58 Iron Set 3-PW as well. This is another tour-quality iron with a forgiving cavity back clubface. Just beware, the price of the Mizunos is considerably more than these bargain basement priced Nike CCi's.